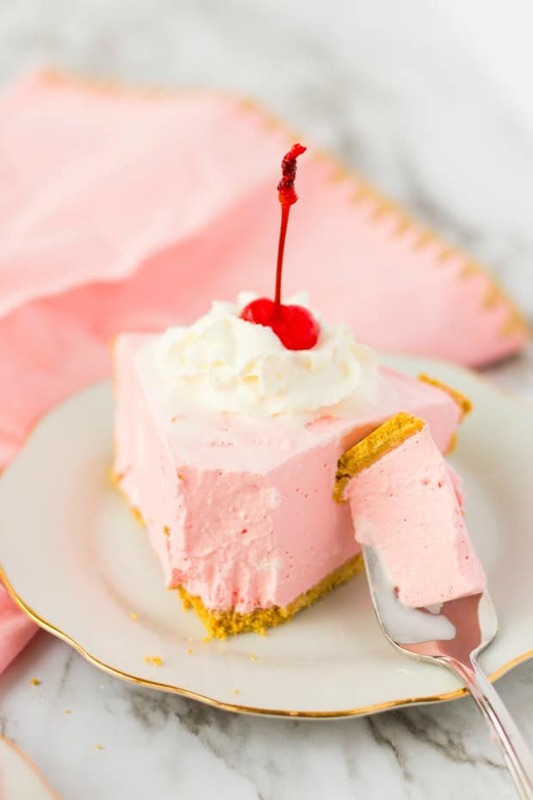 This Strawberry Jello Pie is the perfect cool and creamy treat to enjoy. 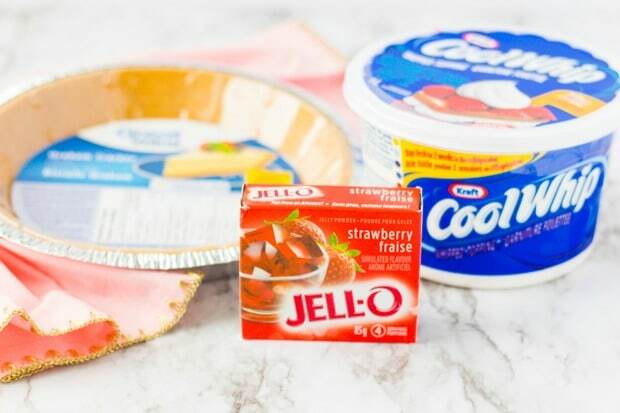 Grab Cool Whip, Jello and a graham cracker crust and you’re ready to make this quick jello pie. It’s the perfect comfort food after a long day or to serve last-minute guests. I especially love it on a hot summer day. 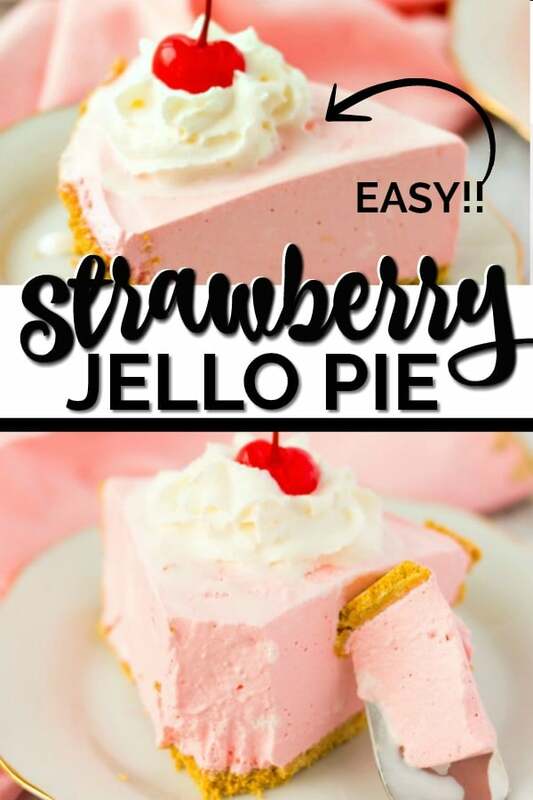 Although I’ll happily eat this delicious strawberry jello pie all year round. There is something about a cool Jello pie that is so comforting and delicious, and if you’ve never made one it’s shockingly easy to make. 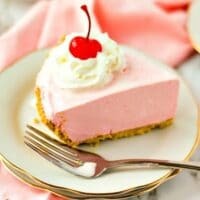 This pink Strawberry pie with Jello is the perfect no bake dessert for guests or a special weeknight supper. It boasts a fresh flavor with an easy filling nestled in a graham cracker crust. It’s a simple homemade offering at it’s best, just like my strawberry cheesecake pie or my no bake pumpkin pie. When fresh strawberries are in season, I love baking with strawberries. This is a quick recipe that kids can help make and is perfect for when you want something sweet and delicious but don’t want to be spending too much time in the kitchen. It’s no-bake — so it’s great if you’re already using the oven for something else or if you just want to avoid turning on the oven! It does take a while to set so ensure that you give yourself a good 5 hours before you want to enjoy this easy pie with your loved ones. 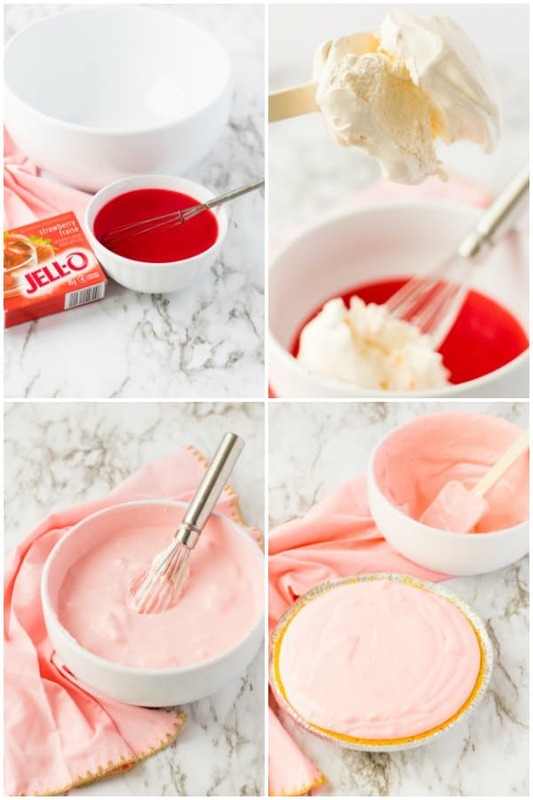 If you’re not a huge fan of strawberry flavoring, you can swap that out for any Jello flavor you’d prefer! My boys love making it with other flavors so they can also get other colors. 😉 They think blue or green pie is pretty magical. It makes them so happy, I let them get creative and experiment with their own jello pie recipes. You could also top it with fresh strawberries (or other fruit) for an extra touch and burst of flavor. Of course, my guys also pile on the Cool Whip on top of the pie before serving as well. I’m pretty sure Cool Whip is one of their favorite foods! Boil your water as you prepare your other ingredients. Stir together the boiling water and strawberry Jello for two minutes until completely dissolved. Add the ice cold water to the gelatin mixture and stir until slightly thickened. Then whisk in 2 cups Cool Whip until well blended. Refrigerate the pie filling for 30 minutes. Smooth out into the prepared pie shell and refrigerate 4 hours or overnight before serving. I cut generous slices and serve cold, topped with dollops of Cool Whip or whipped cream. A bright, fresh cherry on top is the perfect finish before serving. You could also top with other fresh fruit, like strawberries. If you have any pie leftover, just pop back in the fridge or freezer to keep cool until serving more. My boys love the consistency and flavor. They could easily devour the whole pie in one sitting because they enjoy it so much. And I’ll let them as thanks for a job well done helping mama in the kitchen. I hope your family enjoys this easy and yummy strawberry Jello pie as much as we do. 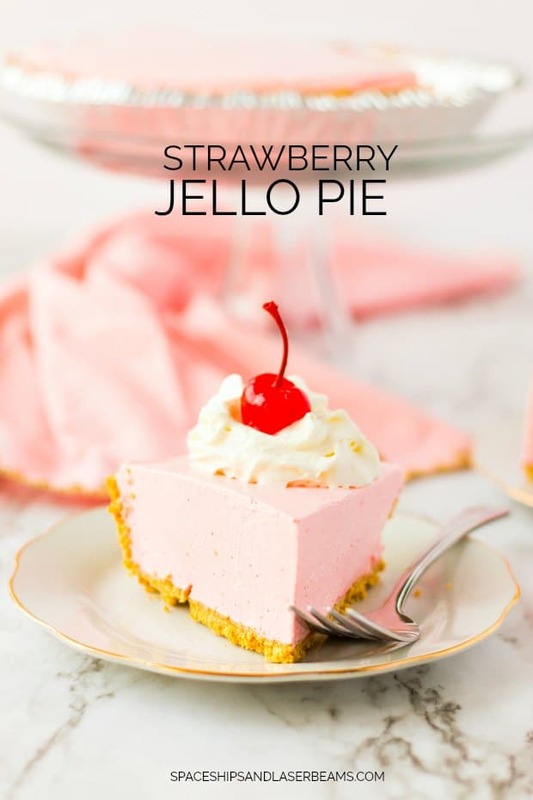 This easy, delicious and creamy Jello Pie is the perfect treat! Stir together the boiling water and strawberry Jell-O for two minutes until completely dissolved. Whisk in 2 cups Cool Whip until well blended. When I made it I had enough to make 2 pies. Love this recipe, I have been doing it with blue raspberry jello and oreo crust, but I still follow this so they come out good. I have some peach jello that I’m going to try with a graham cracker crust. I kept it in the fridge the whole time. I would imagine it could be frozen and thawed without a problem!